WISE, John Sergeant, (son of Henry Alexander Wise, grandson of John Sergeant, brother of Richard Alsop Wise, and cousin of George Douglas Wise), a Representative from Virginia; born in Rio de Janeiro, Brazil, December 27, 1846, while his father was United States Minister to that country; attended preparatory schools in Goochland and Princess Anne Counties, Va., and the Virginia Military Institute at Lexington in 1862; participated with the institute cadets in the Battle of New Market during the Civil War; subsequently became a lieutenant in the Confederate Army; was graduated from the law department of the University of Virginia at Charlottesville in 1867; was admitted to the bar the same year and commenced practice in Richmond, Henrico County, Va.; unsuccessful candidate for election to the Forty-seventh Congress in 1880; United States attorney for the eastern district of Virginia from May 1882 to March 1883, when he resigned, having been elected to Congress; elected as a Readjuster to the Forty-eighth Congress (March 4, 1883-March 3, 1885); was not a candidate for renomination in 1884; unsuccessful Republican candidate for Governor of Virginia in 1885; moved to New York City and engaged in the practice of his profession; died near Princess Anne, Somerset County, Md., May 12, 1913; interment in Hollywood Cemetery, Richmond, Va.
Campbell, Otho Carlino. 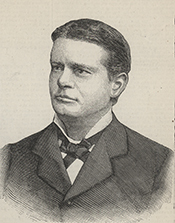 John Sergeant Wise: A Case Study in Conservative-Readjuster Politics in Virginia, 1869-1889. Ph.D. diss., University of Virginia, 1979; Davis, Curtis C. Very Well-Rounded Republican: The Several Lives of John S. Wise. Virginia Magazine of History and Biography 71 (October 1963): 461-87.